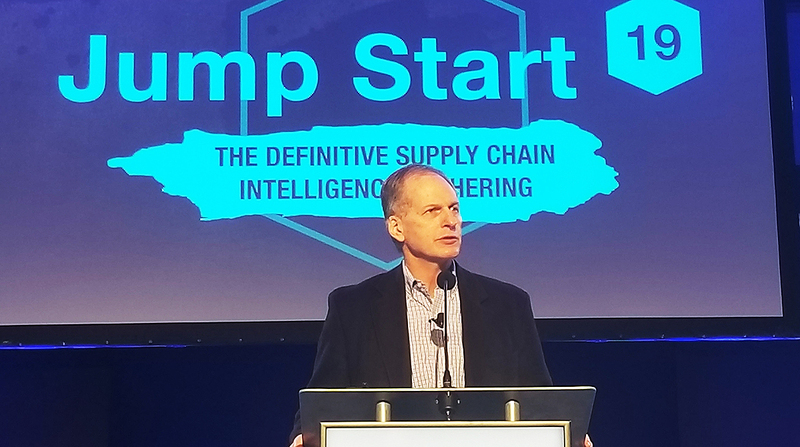 ATLANTA — The future of autonomous trucks is further down the road than people believe, but final-mile delivery by robots is closer to larger use, said Steve Banker of ARC Advisory Group, giving his assessment of future disruption at the SMC3 Jump Start conference. Banker told the audience of about 550 trucking and logistics officials on Jan. 29 that while autonomous trucking research is underway and models are being tested, he expects it will be a while before they’re widely deployed. “No one thinks we are going to be there within 10 years,” Banker said. “Most folks think it’s certainly going to be longer than that.” He added that the likely first step is for trucks to go from no autonomy to limited autonomy. Cities and urban areas are a particular problem for autonomous trucks, Banker said, so the focus instead will be on having autonomous trucks travel between designated stops along highways — travel centers or factories, for example — with human drivers switching out at stops along the way. Once close to delivery, drivers will take over to navigate the trucks in more congested areas, he said. While Banker noted technology advocates tell him widespread use of autonomous trucks in this stop-to-stop model could be implemented within three to five years, he is skeptical. “My guess is they have a vested interest in being optimistic so it’s probably going to be longer than that,” he said. During remarks on the second day of the conference, Banker spoke not just about the prospects for disruption in the supply chain, trucking and delivery systems over the next decade, but also about how he has sometimes underestimated the speed of change. Right now, for example, e-commerce is rapidly changing systems of delivery and site selection for warehouses, he said. And driving that change is e-commerce in urban areas, which is presenting challenges for retailers and freight companies. One urban solution may be to locate warehouses in the rear of retail outlets, he said, noting that he expects to see innovation with locations of warehouses. The pressure will be intense as e-commerce goes from 10% of retail sales to 30% in the future, and the scramble for logistical solutions and delivery methods will be “messy,” Banker said. To address demand for last-mile deliveries, he pointed to options such as robotic delivery systems, for example those offered by Starship Technologies. The devices look like ice coolers on wheels and are in limited use in Europe, San Francisco and Washington, D.C. The company’s website claims the robots have traveled more than 100,000 kilometers making deliveries. Banker said this general technology is more mature than other innovations he discussed, including blockchain and the “Uberization” of freight. Another technology that still is developing is truck platooning, in which several trucks travel nose-to-tail in a tight-knit pack to reduce wind resistance and, as a result, boost fuel economy. Banker noted that its potential could be limited if the trucks must travel to the same destination, and suggested that the ability for trucks to join and leave platoons while traveling down the road could help expand its potential. Banker acknowledged that this model presents challenges, including how to make it work and also how to ensure the leading truck reaps some benefit. “We need the savings to be shared (because) the guy at the front of the line is not getting the savings,” he said. But he believes all of these challenges must be addressed before platooning can see wider use. The SMC3 Jump Start 19 conference was held in Atlanta from Jan. 28-30.